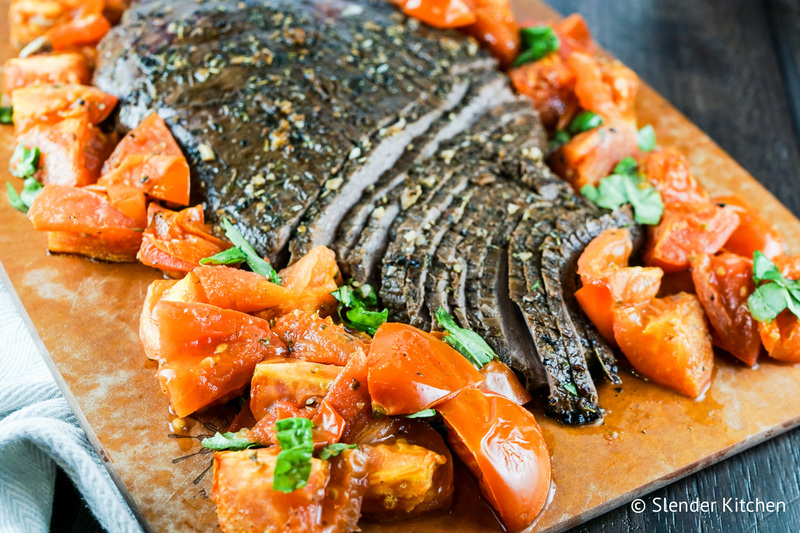 A delicious Balsamic Flank Steak with Roasted Tomatoes that is ready in under 15 minutes with the help of the broiler. Plus it’s low carb, Paleo, Clean Eating, and Whole30 friendly. Mix together the olive oil, vinegar, garlic, rosemary, oregano, salt, and pepper. Marinate the steak in this mixture for at least 1 hour up to 24 hours. When ready to cook, preheat the broiler. Spray the tomatoes with cooking spray and sprinkle with garlic powder, oregano, salt, and pepper. Cover a broiler pan with foil. Remove the steak from marinade, letting excess drip off. Place the steak in the middle of the rack and cook for 4-6 minutes per side for medium. When you flip the steak, add the tomatoes to the pan as well. To grill: Grill the steak for 4-6 minutes per side for medium. When you flip the steak, add the tomatoes directly to the grill or in a grill basket and cook until warmed and beginning to char. Let the steak rest for five minutes before serving. Slice against the grain into thin strips. Roughly chop the tomatoes and toss with basil. Serve with the steak.